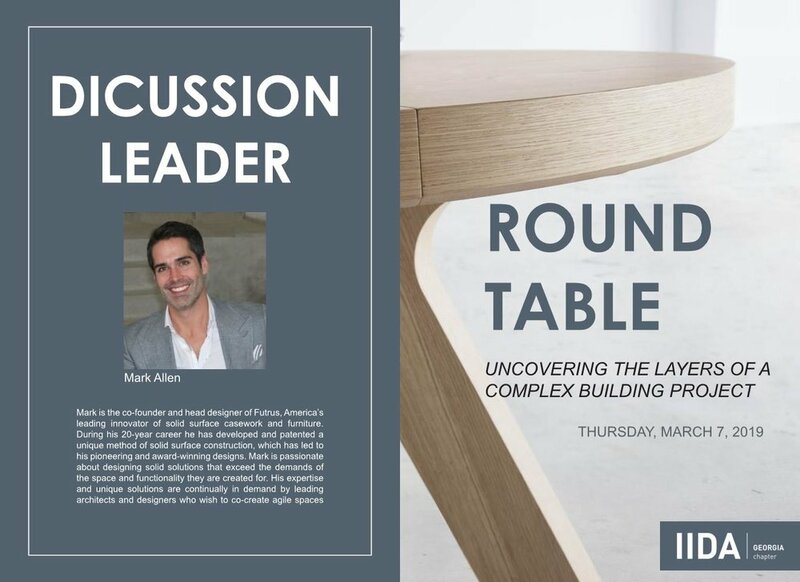 IIDA Gerogia’s Round Table Discussion event, Uncovering the Layers of a Complex Building Project, held at Mannington Commercial’s showroom on March 7th, provided an interesting and casual discussion between six industry professionals. Amongst the six were Shelly Attila (IIDA), George Smith, Kris Kirchner (IIDA), Jesse Frasier, Katie Trice (IIDA), and Matt Hayner (IIDA). Hosted by Mark Allen, the group aimed to discuss what it takes to design a complex building project. Each panelist provided interest insight and knowledge from their experiences. If you were unable to join us for the event, we hope the following summary of discussion highlights are inspirational and thought provoking. Pictured from left to right: George Smith, Katie Trice, Matt Hayner, Mark Allen, Kris Kirchner, Shelly Attila, and Jessie Frasier at Mannington Commercial’s showroom. Question 1: The place to begin any design project is with the problem. Other considerations, such as budget, schedule, technology, skills, media, form, navigation, and even content, grow out of the problem. Everything else is subordinate to the problem. Basically, form follows function. As this design process unfolds from start to finish, tell us how your roles play a part in this process and some highlights of that design process. The group began by discussing how every project is different from renovations within existing complex buildings to designing for a new constructed building. A great deal of the panelists expressed the unknowns that are always uncovered during these project. Kris Kirchner explained that on renovation projects, designers aim to think about the aesthetics of a project, but the Mechanical, Electrical, and Plumbing needs commonly consume most of the budget. On complex projects, there are many unknowns that expand beyond the existing conditions. Often times the client knows what they want and their expectations for the project, but Katie Trice mentioned how part of the design process is “helping your client define what they don’t know.” In addition to helping clients discover the unknowns of a project, designers sometimes have to “act as an interpreter to get leadership and user groups to align with their mission for a project” (Shelly Attila). Jesse Frasier built on that concept by describing the importance of getting knowledgeable user groups involved on a project early on. Having an open discussion with your client can be the best resource, and in essence, people are one of the biggest factors of a complex project. Question 2: Integrated Project Delivery (IPD), Performance Based Design vs. Design Build, these delivery models have been used on programmatically complex facilities when the client is not sure of all their requirements. Do you use these approaches for design, and do you see these methods changing? Does the collection of past project data intelligence inform the delivery method? Has the collection of that data changed over the years? Question 3: With increased labor shortages, natural disasters, change in tariffs and changes in the construction industry how does integrated data expedite construction through accurate and efficient planning and design? Does predictive analytics assist with decision making in pre-construction? Things change so quickly in construction, so how do you keep long term construction projects cutting edge from concept to completion? Kris Kirchner began to explain that in a complex healthcare project, flexibility must be considered. She points out that “you never know what the next equipment size is going to be,” and that type of planning is included within the project’s infrastructure. For fast-track projects, contractor’s prove to be a huge resource during a design-assist process. Both George Smith and Matt Hayner shared their experiences with having design-assist on their project and the importance of involving a contractor early “to study options and pricing.” Katie Trice added the benefit of partnering with a contractor early on in a long-term complex project, like an aviation project which may take years to build, and how contractors can help “account for escalation, market changes, and labor shortages.” In regards to higher education projects, Shelly Attila discussed how flexibility is considered differently for labs and is used as a modular approach. She shared an account for a current project where the flexibility of modular lab casework allows the client to build-out part of a space in modules with the opportunity to add modules later for growth or expansion in the future. Question 4: In the last decade, technological breakthroughs have had a significant impact on the world, so how is technology changing your design projects and facilities? What do you see being impacted the most? What are some of the newest technologies affecting building construction? A few of the panelists, Kirchner, Smith, and Attila, described the importance of BIM and Revit for client visualization. Using visualization techniques through BIM softwares helps to start a discussion that may otherwise not happen. Shelly Attila explained that a client might notice something in a perspective image that they might not notice until a project is under construction. She hit home with a statement saying, “people understand images, people don’t understand the little lines that [designers] draw.” George Smith and Jesse Frasier discussed how not only can BIM and Revit be a useful visualization tool, but in-field mock-ups and life-size cardboard models can help communicate a rooms size and function to a client for buy-in. Matt Hayner illistrated how he used virtual reality technology to help a client visualize what their private offices would look and feel like. Technology can also be used during the initial field verification process. Katie Trice told how she used Point Cloud scans in her aviation project to verify locations of MEP systems in the existing building. She adamantly shared that technology is a great tool, but as designers, “sometimes we need to get out of that model, out of our offices, and go into the field” to truly understand the building conditions. Question 5: Commercial design and construction have found ways to improve the way our industry approaches the construction of property and optimizing operating efficiencies for property owners through Green Building and LEED Certified buildings. Are you also using this approach in your design process and for your facilities? How does it compliment LEED? With the rise of WELL building standard, are you sourcing more red-list free materials? Lab design and healthcare design can often fight with LEED depending on the MEP requirements for the project. Smith and Attila described how some of the plumbing and air requirements needed for these types of projects are not the most energy efficient, but that there is a desire from clients and changing technology that is moving toward more sustainable practices. 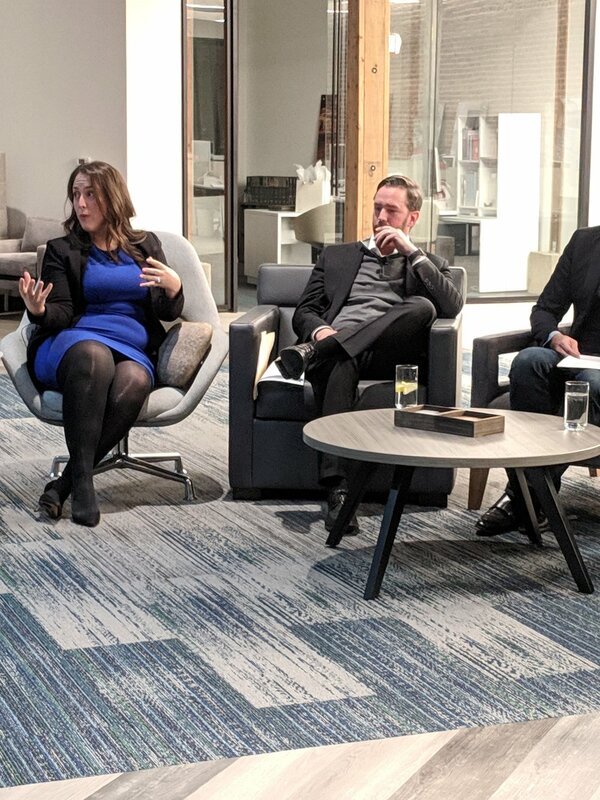 Kris Kirchner shared that her clients “strive to follow LEED requirements, but don’t always want to pay for the costs for LEED certification.” Some clients have the intention of sourcing sustainable and responsible products and practices but don’t strive for the LEED plaque. Jesse Frasier explained that while he has been a part of very few LEED certified projects, he has seen other programs, like Georgia Peach, being used in lieu of LEED. “I think [sustainability] is a social responsibility,” Katie Trice shared. She recalled how the industry as a whole has improved designs and products to be more sustainably conscience and how young designers are passionate about sustainability practices.